Knee cap exercises can be really helpful in reducing knee pain. 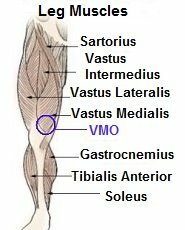 They strengthen the VMO muscles (Vastus Medialis Oblique) around the patella improving how the kneecap moves. The VMO muscles are part of the quadriceps muscles and are found on the inner side of the knee. Their job is to control the kneecap movement, known as patellar tracking. They hold the kneecap in the middle of the patellar groove so it glides smoothly during any leg movement. If the kneecap muscles are weak, the kneecap shifts slightly to the outer side of the knee. This prevents it from moving properly, known as patellar maltracking, which leads to pain and irritation. 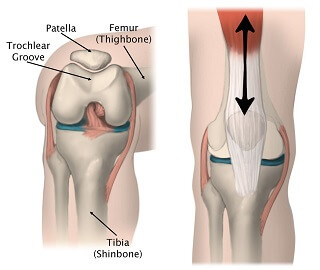 Knee cap pain is common and is often caused by conditions such as Runners Knee and Chondromalacia Patella. Why Do Knee Cap Exercises? The VMO muscles should be working the whole time when the knee moves, but if there is knee pain or there has been a kneecap injury such as a dislocation, they often switch off and stop working properly. Regular quads strengthening exercises e.g. squats and lunges, don’t specifically target the VMO muscles. They need to be strengthened in a slightly different way. Here you will find some easy to perform yet effective knee cap exercises for the VMO muscles. They will improve your patellar tracking and the stability of your knee. Before you can strengthen the knee cap muscles, you need to know how to make sure they are working. Sit comfortably in a chair and put your fingers at the top of your kneecap. Move your fingers up an inch, and inwards an inch so you are on a soft fleshy bit – this is the VMO. Push your knee and foot down into the floor and you should feel the muscle tighten/clench under your fingers. It might take a few goes before you feel this – keep practising. When you are doing any of the knee cap exercises below, keep checking that you can feel the VMO muscles working. Once you are happy that your VMO muscles are working, you can start doing these exercises. Get the hang of stages 1 and 2 before moving on to stage 3. Progression: Start with rolled up towel underneath your knees they are bent 30°. Squeeze the football as before and then lift the foot of the weak leg up off the bed, straightening the knee, maintaining the squeeze on the ball. Hold for 3 secs, slowly lower the leg and finally relax the knee. Note: Ensure that you keep squeezing the ball throughout knee cap exercises – keep the knee and buttock clench going throughout. Progression: Progress the exercise by gradually increasing the depth of the squat but take care not to aggravate your knee pain. Once you have got the hang of these knee cap exercises you can incorporate the VMO clenches into your other exercises such as squats and lunges. Visit the knee exercises section for help finding the right exercises for different knee problems to help you beat your knee pain. You can also visit the knee cap pain section to find out more about the common causes of patella problems.